As I write - there are exactly 8 weeks to go before 29th of March when 'Brexit' happens and Britain will be exiting the EU with perhaps many unforeseen consequences. You'd have to be living on another planet not to be aware of that by now! We live quite close to the border with Ulster here (roughly about 50 miles or 35 minutes drive) and I normally shop up there in Newry about 4 times a year, for organic items which either aren't available, or are far more expensive down here in the South. As a British person who has lived in Ireland for over 40 years, in some ways I have a unique perspective on the whole Brexit situation. Infuriating and perplexing as it is - although I have very strong views on it, I'm not going to comment much on the politics of the mess we all appear about to be landed into very soon, on both sides of the Irish Sea! I must say though that it's particularly upsetting when one hears such things as the news I've just heard on BBC Northern Ireland - that after Brexit, children with congenital heart disease will no longer be able to travel south to Dublin for life-saving surgery. Brexit will have REAL effects on REAL people's lives, and in some case those effects could potentially even be tragic - yet how many of those few politicians there clinging onto personal power actually care? This despite the fact that the majority of those living in Northern Ireland voted to remain in the EU, because they understood as only they can - that it was the safest option and that even though it may not be ideal from every perspective, it's better than the alternative - which could possibly be going back to a Northern Ireland which everyone here thought was gone forever. We still don't know what kind of Brexit the UK parliament wants, or what form it will take - and neither apparently do they - or so it seems! But it does seem increasingly likely that many aspects of our lives will be thrown into chaos - even quite possibly endangering the hard-won peace which we've enjoyed here for the last 20 years - since the Good Friday Agreement. Unless one has experienced it - it's very hard for anyone to understand the feeling of dread when encountering border checks - with unknown groups of men on the road carrying weapons, perhaps in the dark on winter evenings - who could be from either a police force or some terrorist group. Even very recently - I still experienced a little of that stomach-churning feeling of dread again, when I got lost trying to find the hatchery in County Armagh, just north of the border, where I was to pick up my day-old chicks. It was getting dark, I was alone in the car, I was lost, one of my front tyres was getting soft, and all of the mobile network was down on that particular day, so I couldn't even call for directions! Familiar place names on almost every signpost I passed leading off the new motorway onto the narrow, unlit country roads are still a grim reminder of well-known, often tragic incidents that took place during 'The Troubles'. Even though I kept telling myself not to be over-imaginative, and keep calm - those names are forever indelibly printed on the minds of anyone who lived through those dangerous times here - let alone those who were personally affected by them. It makes me very angry to think that this whole Brexit thing is happening mostly due to a few self-serving, power-hungry politicians - and some voters who were gullible enough to believe their lies, with promises of everyone having more money and more control over their lives - when it's now becoming increasingly apparent that quite the opposite is true! In respect of food - Brexit will undoubtedly affect every aspect of our lives here in Ireland and in the UK - especially in terms of food availability, but to what extent, we don't yet know. One of the topics on last Sunday's interesting Food Programme on BBC Radio Four highlighted just how dependent we are on fresh food coming from Europe - both in the UK and Ireland. This is especially the case with supplies of organic fruit and vegetables, which obviously can't be stockpiled unlike packets of processed foods. Memories are still fresh here of last year's panic-buying of fresh bread, which disappeared off the shelves completely during the long spell of snow - and also of the shortage of imported Iceberg lettuce and other salads here and in the UK in early 2017, due to bad weather in Spain and Portugal. Over the last few months I've seen many warnings in the media about fresh produce in particular being short after Brexit finally happens on March 29th, with vendors saying that chaos will ensue in the event of a "no-deal Brexit" - resulting in produce on lorries being backed-up at ports, unable to enter the UK. Much of the fresh organic produce in supermarkets from January until May or June is now imported from southern Europe. All fresh produce like polytunnel-grown broccoli and spinach (two in particular which come from Spain, Portugal and Italy) - may be in very short supply or even non-existent before the supply chain situation normalises again, or fresh produce grown in the UK is in season once more. In Ireland, it may not be in such short supply after Brexit, as there are alternative routes like Cherbourg, rather than produce travelling through Calais to the UK and then on to Ireland, as most fresh veg deliveries do currently. But it may still take a little longer to reach us by a different route, coming direct from France rather than through the UK, so it won't be quite as fresh even if it is available. But with so many unknowns, and with 40% of all the fresh produce in the UK coming from the EU and a similar amount imported into Ireland, perhaps it makes sense for each of us to consider just how resilient we are individually -, in the event of some fresh foods or other food supplies perhaps being in short supply for a few weeks? My main concern now - like many of you I'm sure - is to be able to continue to feed my family the organic food which we've eaten for over 40 years. We try to be as self-sufficient as possible here in many things, but due to degenerative disc disease - I'm no longer able to do some of the tougher jobs, like handling weighty sheep, which I did years ago. As many of you will know, I now concentrate on rearing poultry, which are lighter and far are easier to manage. If necessary - we could survive on chicken without buying any other meats, as we would also have our own eggs. We only eat meat or fish perhaps 2-3 times a week here anyway, eating vegan or vegetarian the rest of the time - but we do like to eat some red meat - perhaps once every week or so. All the meat we eat here is organic, higher welfare - and it is enjoyed as the very special treat which it is - just as it was when I was growing up. Chicken then was always a home-reared cockerel - or capon - as it was known then - which had spent a wonderful life foraging in our orchards before eventually being a very special and thoroughly appreciated Sunday dinner. Most chicken consumed nowadays is the cheapest, most taken for granted, most intensively reared meat possible, and probably much of it is probably wasted. This year I'm rearing my own again, as I mentioned last month, and I know that nothing will compare with them. Any meat which I now no longer rear myself - we buy from an organic butcher - Coolanowle Farm Meats in County Carlow - who deliver to farmer's markets in Dublin regularly and do mail order. Organic grass-fed meats generally shouldn't be affected by Brexit - except in those supermarkets buying meat in the UK. When it comes to buying in chicks or other animals from Northern Ireland for rearing however - new regulations may well apply after Brexit - so it might be a good idea to inquire about those if you're thinking of doing so. Any organic concentrate feeds needed for poultry and other livestock could also possibly be an issue after Brexit, again until supply chains have once again normalised. Most organic feed is milled here, but may include some ingredients coming from the UK - and those will of course have to be re-certified, as current EU equivalence of standards will no longer apply, which will mean a lot of extra paperwork and possible delays for months. I intend to make sure that I will have at least a couple of month's supply of organic hen food as a back up just in case of any delays in the system. This is something I've always done as a matter of course anyway, since my days as a commercial organic producer, as an insurance policy against feed not being available for whatever reason. If you are a commercial certified organic producer - you are not allowed to substitute conventionally-grown livestock feed for organic feed in the event of a shortage. If you had no choice but to do that due to welfare concerns if no organic feed were available for whatever reason - then you would lose organic certification for those animals. I wouldn't want to do that anyway, as I don't want to feed my hens genetically-modified ingredients or Glyphosate - and then by proxy - naturally us! In terms of other fresh meat or dairy products which we don't produce ourselves - butter and milk would be our biggest concern, as we can source good organic cheese here in Ireland from The Little Milk Company - who make a wonderful range of award-winning, organic cheeses. I learned the hard way to always be prepared for any emergencies, as we were snowed in for 3 weeks during our first winter after we moved here 36 years ago. Luckily a very kind neighbour drove through the snow on his tractor to fetch milk from the nearest small town 7 miles away, or we would have had none at all for at least a couple of weeks. Now I always make sure that we have enough milk frozen to be able to survive without a trip to the shop for at least 2 weeks. I think most people not living in the country would find that quite strange, in the age of a convenience store on every corner and in almost every petrol station - but we don't have those out in the country here. Even our local village store, which doesn't sell any organic products, is 2 miles away. Anyway I try to keep our carbon footprint and any shopping trips to a minimum, so we only go about once every 10-14 days to buy organic milk and always have some frozen just in case of emergencies! I'm always aware of how lucky we are compared to those who are totally dependent on shops for all their daily food needs - but at the same time, it has taken a lot of hard work to become relatively self-sufficient in some foods over the years. I'm always so grateful for the hard work of those who produce what we can't. So many people seem so removed from the reality of where their food comes from now - that I think many would find it impossible to understand the necessity of always being prepared for any contingency. However, having been brought up on a small farm in the UK, by parents who went through World War Two and who experienced rationing, probably made me aware at a much earlier age of just how valuable food resilience is. It was really brought home to me again recently listening to the extremely worried Guy Watson from Riverford - the UK-wide organic veg box scheme, who had recently bought a farm in France specifically to supply his customers during the so-called 'Hungry-Gap' from late winter to spring, when little fresh produce is available in the UK. His business could well go under because of Brexit and the delays in establishing equivalent organic certification etc. which will undoubtedly be the result. I could perfectly understand when he said in Sunday's BBC Food Programme that he is I quote: "Almost too angry to speak - to be told by people who have NO idea how their food is produced that this is Project Fear makes me incandescent with rage"! Then I was too - after hearing another comment from a British food writer living in Portugal, saying that "if farmers went out of business - then it was a good thing, and their own fault!"... Simply unbelievable ignorance from someone who is, as far as I'm concerned, little better that a parasite living off our food system! Perhaps some people may have to face the reality of just how precarious food security really is after Brexit? If so - then it might be no harm - and perhaps might make them appreciate hard-working farmers just a little more, instead of taking for granted the freely available produce which shoppers are always able to 'harvest' so easily from off supermarket shelves? Here endeth the rant! Imported store cupboard staples which we don't grow ourselves - such as organic flour - may well also be in short supply here in Ireland after Brexit, as there are only three flour mills in the entire island of Ireland - and two of them are actually in Northern Ireland! I make bread roughly 3 times a week as a matter of course, so I always need to know that I have enough flour and dried yeast in the cool larder to see me through for at least the next four months. At certain times of year here - spelt flour in particular can be in short supply, especially when it gets close to harvest time in summer, when supplies of the flour milled from the previous year's crop may begin to run short. Only you will know what your staple pantry foods are though - so it's up to you what you wish to store or stockpile just in case of shortages. While I don't think there's really any need to panic buy - all I would say is that it might be sensible to at least have a couple of months supply of things which you feel you can't do without, can't make or can't grow yourself, such as dried pulses, nuts and seeds etc. cereals like wholegrain rice, oats and barley, dried fruit, sea salt and perhaps sauces such as organic soy sauce etc, cider vinegar, herbs and spices imported from the UK and any other such things. Keep all those things dry and cool and as long as they have a decent use by date on them they will be fine. Most things will in fact keep far longer if kept sealed and cool - only perhaps losing a few nutrients at worst, but otherwise perfect. As far as fresh veg and fruit goes - having the polytunnels is an absolute boon, because they mean that we always have some sort of seasonal veg available here especially salads, even in winter, and also plenty of fruit and veg like peas and French beans grown the previous year and stored in the freezer. For anyone who eats a lot of fruit and veg which may possibly be in short supply - then perhaps this is might be a good time to try your hand at growing a few salads in containers for the first time? Even if it transpires that salads aren't in short supply, they will still be jolly useful and will save you a lot of money! Being a practical person - I personally ind that doing anything rather than just waiting and worrying about a problem, is always the best course of action, and far better than doing nothing. It works for me - and usually pays off! 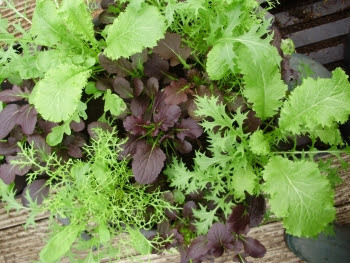 That being so, I thought it might be a good idea to make a list of some really easy, fast growing salads and other veg, which anyone could grow - as those will be the first things to be hit, if supplies from Europe are either delayed or non-existent. All of my suggestions can be grown in greenhouses or polytunnels, and if you don't have on of those - they can also be grown on patios, balconies or on paths in tubs or other containers, or even in window boxes - if they're protected with fleece, if frost threatens. All of my suggestions can be sown inside the house now - and grown on as seedlings either on a windowsill, outside in a polytunnel, or against a south-facing wall in a cold frame again with frost protection - then planting out when they are large enough. You don't have to spend a fortune on containers - anything will do if it has drainage and can hold enough soil or compost - all you need for most veg, especially salads is a depth of about 15 cm or 6 inches of compost for really good growth. Below there's a description of exactly how I sow my seeds and why, which I hope you'll find helpful. The propagating bench is where all the gardening action is currently! At the moment, soil is still saturated outside in most places - either having been snow covered or even flooded, that it's impossible to touch any vegetable beds, whether raised or not, without ruining the soil structure, apart from the other reasons below. Nothing likes growing in a compacted soil except the odd weed! As a consequence - all the gardening action here is taking place on the propagating bench pictured above in the polytunnel - where there's lots of things which were germinated on the back of the range in the kitchen and are now growing on in the frame on the heated mat at about 50degF/10degC, ready to be planted outside or in the tunnel later. On the bench pictured above I have two cheap Lidl cold frames sitting on a roll-out heated mat - which is a bit like an electric blanket. It keeps things at a 'just warm enough' 50 degF. The mat sits on a recycled door supported by trestles. To cover then at night I roll out double fleece and a large piece of recycled bubble wrap. So as you can see - it's not very hi-tech but it's very effective! If you're impatient to get an early start, you can steal a march on spring and sow a few early seeds now if you have a warm light enough windowsill indoors, or much better still a heated propagator in a greenhouse or polytunnel where the light will be better. You can sow your seeds now in pots or modules for planting outside later on - there's a list on the "What you can sow" page. Even if the 'gardening itch' hasn't got to you yet this year and you don't want to start quite this early - then it's a good idea to have everything ready to go when you do. I love sowing seeds - it's such a hopeful and positive thing to do - it's an investment in the future, short or long term, that pays off in abundance. A great many of the things that need to be sown in the next few weeks we'll be eating this time next year. This is the start of the most important time of year for seed sowing - and the same advice applies whether you only have a cold frame or just a warm windowsill. At the moment the soil is saturated everywhere - far too cold and wet to attempt to sow anything outdoors - and even by the end of the month I doubt if it will be much better unless the weather improves a lot. There's no point wasting expensive seed by sowing it into cold wet ground. It's not really until early March that any sun is strong enough to even begin to warm the soil at all for sowing - and when it is you'll begin to see weed seeds germinating, which is always the best guide. If the soil's warm enough for them - then it's plenty warm enough for some of the the hardier crops to germinate. I sow nearly all my crops in modules now though - as that allows me to get ahead whatever the weather, which means I can plan better, and it helps to make the most of valuable growing space. Obviously the most important thing to do is always adapt any guidelines to suit your own local climate and soil. That can vary hugely depending on exactly where in the country you live - and often even in individual gardens in the same area. For instance - early spring can arrive in the very north of Ireland up to three weeks later than in the warmer south - and the same goes for the UK. Even within a few miles it can vary surprisingly. Where I live now - 400 feet above sea level on a south west facing slope in the teeth of the prevailing SW wind - the season is at least ten days later than where I lived 35 years ago - down near the sea only 9 miles away. Sowing most things in modules all year round wastes far less seed and I know I can be more sure of the results! The only exception to this would be root crops like parsnips or carrots - which are really much easier to sow direct in the ground. I only sow these into my recycled 'loo roll middle' modules if I want to make a really early start - or if their allotted space isn't free yet. As I mention later - doing this really makes the best use of your space, as the minute you have a crop cleared - you have another ready and waiting to be planted. By sowing in modules you're not spending time waiting for seed to germinate in ground which early in the year may be far too wet and cold. Carrots and parsnips like quite a warm seedbed and can be very slow and even rot if the ground is too cold. They can also take up to three weeks to appear and with carrots - the tiny early seed leaves are so fine that they're quite difficult to see - so often slugs will have eaten them before you've even noticed they were actually germinating! If you're planning to sow any crops early outside perhaps in March, and their planned space is free at the moment - then it's a good idea to cover it with some black polythene now (it should be covered anyway if you've been following my advice!) Then you can uncover it every so often and clear up any slugs which are lurking around just underneath and get ahead of them too! You'll be amazed how many you'll find hiding under there - they won't bother going underground if they can hide in the dark somewhere damp and snug and they think they're out of sight! If you leave soil uncovered, as some people advocate - the slugs also just hide underground or around edges of beds. They've evolved to hide from hungry birds and hedgehogs - not hungry gardeners! So be clever and outsmart them - it's always a good idea to trap and dispose of as many slugs as possible before you actually start the growing season - that gets you well ahead ahead of the game! Please don't be lazy and thoughtlessly use slug pellets - they kill all slug-eating wildlife too and traces of the poisonous metaldehyde they contain are increasingly being found in our drinking water as well! If you have ducks they're the very best slug hunters of the lot - they seem to have slug radar in the tips of their beaks - and they'll even eat the really big Spanish ones like rubber tyres which hens won't eat. But beware - as ducks are also extremely fond of anything edible, luscious and green - so don't let them near any lettuces etc. Also be careful if your soil is a heavy clay as they'll pack it down with their webbed feet - causing compaction, 'souring' and acidification - so don't leave them on any patch of ground for too long. After you've sown crops - a strip of black polythene, or a piece of slate at various points along the bed will give any remaining slugs a place to hide - so that you can then go along every so often, scoop them off and dispose of them - or cut them up with sharp scissors and leave them for wildlife to enjoy! When you've got rid of most of the slugs, then you can put some clear polythene on to the bed. This will allow the soil underneath to warm up so that it's all ready. If you see any weed seeds germinating at this point - a flame weeder can be very useful for burning off any tiny seedlings to make what's known as a 'stale seedbed' - which is perfectly clean on the surface and ideal for carrots and other small seeds. (If you're of a nasty frame of mind - a flame weeder's also great for barbecueing slugs!) Remember - weedkillers aren't just toxic - they don't actually kill weed seeds, so they're pointless poisoning! It may seem a bit fiddly sowing things into modules like plug trays, pots, or seed trays, but it's what I call my 'guaranteed one-step method to perfect plants'! This method of sowing means you don't have to handle them again until you actually plant them out. Seed germination is far more reliable in the better conditions. I do most of my sowing into modules all year round now. It means I'm not waiting for a patch to be free before I can sow seeds - and I can have something ready to go straight into the ground the minute any crop is cleared - that way I get loads more veg. out of my space. In essence what I'm doing is continuously overlapping crops. By not taking up ground just waiting for seeds to germinate - over the course of a year I gain several extra weeks of growing time out of my ground space and I can fit in another quick growing crop. I've been doing this for years since I first started off in a small garden and it's an even more valuable way to grow things if you only have a small space. Planting out modules when they're ready also means that the plants are already growing strongly, are bigger and as a result better able to withstand the occasional nibble from any slugs or other pests without being completely destroyed. And there's always one or two that escape my early scissor forays! I often get questions from people who think they bought bad seed and it didn't germinate - but usually the reason seeds don't appear is because either the soil was too cold and wet in early spring so they rotted, or they dried out in summer, or slugs ate them as they came up! Sowing into modules avoids all those problems. Bad seed that doesn't germinate at all is thankfully extremely rare. Whatever pot or module you choose to sow in is up to you, there are masses of things which can be recycled for this purpose, and as usual the choice is only limited by one's imagination! The important thing is to make sure they're clean, have good drainage holes in the bottom and that the young plants will come out quite easily, without disturbing the root ball if you gently push them up from the bottom - otherwise you lose the whole point of modules - which is to avoid any disturbance which causes setbacks! Just a word on using loo roll middles as pictured above. I find these brilliant for long rooted things like very early carrots and parsnips because they can be planted out intact as they are - completely avoiding root disturbance - but I don't find them quite as good for other things like lettuce or other leafy crops which have a fine root ball - I think this is because the cardboard rolls are so high in carbon - which needs nitrogen to break down naturally - so it tends to rob this from the surrounding soil or compost as it does so - and also possibly any young plant that is growing in them. The other thing to remember about using cardboard tubes like loo roll middles is that they MUST be planted with the cardboard of the loo roll BELOW soil level - if exposed to the air they will act like a wick, drying out and shrinking - evaporating moisture from around the young plants ans fine roots with possibly disastrous results! The same goes for using paper pots. I get a lot of questions about this from people who have tried i and had disappointing results - but I've never seen anyone mentioning the danger of this happening. I know it does take a little extra compost sowing this way, but sowing into modules also means I don't waste expensive seed - which more than balances out the small cost of the extra compost used. It also means I have larger plants ready to go without losses to slugs. That again also means that I can plan the use of space much better - planting out neat, attractive-looking rows, instead of perhaps having unsightly gaps! I really love that kind of instant potager gardening. It's very satisfying to stand back and look at the results! It makes sense to use a good proprietary organic peat-free seed compost - NOT a multipurpose compost containing peat! A good peat-free seed compost will have been specially formulated to be suitable for tiny seedlings for their first few weeks when their tiny hair-like roots are very sensitive. Many seedlings dislike a high nutrient content in composts - so using one specifically for seed sowing is really important - otherwise too high a nutrient content in the compost could inhibit germination, giving disappointing results. I never found those 'seed & potting' multi-purpose peat composts good for that particular reason when I had no choice but to use them many years ago. They also tend to attract root-eating soil pests too - because all composts containing peat do that! I haven't used them for many years as I only use an organic peat-free compost now. As I've mentioned previously - I use a really good, peat free, certified organic compost. This is available in Ireland from Fruit Hill Farm - (call them for local stockists - getting one bag by post is expensive!). It's also available from White's Agri, at Ballough, Lusk. The compost is produced by Klassman in Germany, from composted organic green waste. It's utterly brilliant and is the very best compost of any sort that I've found in over 40 years of growing. It's also available in the UK, and it's worth investigating if you live there. There are a quite a few other peat-free organic composts available there now too - but I haven't tried them, so can't recommend them. I would always prefer an organic compost - as those containing artificial fertilisers don't produce the most healthy plants in my experience. They are far more likely to attract aphids and other pests as the plant's immune defence systems aren't as healthy. Once you've used the Klassman - I promise you won't use anything else! (I wish I had shares in it!) .It's the best compost of any sort that I've ever used. Whether you're organic or not - believe me - this compost is worth every cent! Plants really thrive in it - I think possibly because it contains a good range of beneficial bacteria, having been made with organically grown green waste, composted specifically for this purpose. But whichever brand you choose, don't use a potting compost for sowing seeds - it will be far too high in nutrients that inhibit germination and burn the roots of the tiny seedlings as soon as they emerge. They may then be sickly, or possibly even keel over and die! I grow a lot of rare plants - many of which are fussy and the seed expensive. I can't afford to risk wasting seed. These days no one can - so always go for a reliable, good quality seed compost - and choose peat free preferably - if you care about the environment. In addition - make sure it's this year's freshly delivered batch of compost too! Not old, saturated compost that's been sitting around outside in the garden centre all winter since the previous year! That would be stale, will have lost many of it's nutrients and may well harbour moulds and diseases. I always make sure that I have a couple of spare bags put by in a dry place so that I have plenty for early sowings the following year. Also don't use garden soil for sowing in pots - it's false economy - especially if you're a beginner gardener. It will contain weed seeds and perhaps pests too, and the texture is unlikely to be suitable for sowing small seeds in pots or modules. I know good compost isn't cheap - but actually most bags these days cost no more than two or three packets of seeds and you won't need a huge amount. If you're careful a little will go a very long way, and you'll get far better results. You'll avoid wasting expensive seed and precious time too. Another point I'd like to mention here is that although some gardeners in the UK don't like using British produced peat composts - some of them don't seem have a problem using Irish extracted peat. I just don't understand that 'NIMBY' attitude, because it's every bit as damaging to the environment and to biodiversity, and releases just as much climate-changing carbon which affects the whole planet. So please have a re-think if that applies to you! I think it's a bit like thoughtlessly throwing away your rubbish out of the car window and ensuring that it becomes someone else's problem! Remember the piece of advice "Whatever else you don't get time for - always sow the seed - you can catch up on everything else except that". - One of the best pieces of advice I was ever given - well worth remembering - and another good reason for sowing in modules so that you're not delayed by the weather or by waiting for another crop to be finished. This is often something that's really hard to remember in the middle of summer, when you're enjoying an abundance of glorious vegetables! If you don't sow many things in June, July and August - you'll have very little to eat in the winter! Don't spend ages waiting around to get ground perfectly ready either, particularly in a wet year, or you may find it's then too late to sow the seed. Sow the seed first, in modules if necessary, and then catch up with all the other jobs later while your seedlings are growing on nicely somewhere else, until they're big enough for planting. It's stating the obvious to repeat that most seed these days is expensive - a little care will make your seed go a lot further and therefore your money too! My apologies to all you 'old timers' out there like me who know all this stuff - but maybe you may actually do it differently - and there's no harm in reassessing the way we do things occasionally is there? Gardening is an occupation where you never stop learning, that's what makes it so interesting. 1. First fill your modules, pots or whatever with good seed compost, firming it gently but not ramming it down too hard. Then make suitably sized small depressions in the top of each one with the end of a old pencil, pen, or whatever's handy. Seed differs in the depth it prefers to be sown, so consult your seed packet on this one, there isn't enough room here! Generally I find a depression of about 1/2-1 cm is suitable for module sowing of most things depending on the size of the seed. A very rough rule of thumb though is to sow at about twice the depth of the seed. 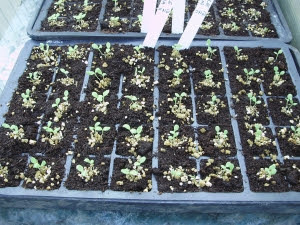 As some really fine seed like celery or Nicotiana prefers to be sown on the surface and not covered at all - If you're going to sow very fine small seed it's a good idea to water the containers before sowing, to avoid washing tiny seed either too deeply into the compost, or alternatively washing it completely out of the compost! Some brands of seed composts can be quite difficult to wet if they've become exceptionally dry - so when sowing anything it's probably a idea good to moisten all composts a bit first - and letting any excess drain away. 2. Next, after you've prepared your modules, before you even handle the seed packet make sure your hands are absolutely clean and dry! Don't attempt to open the packet with dirty wet hands from preparing your compost, soil or whatever! Unless you're going to sow all the seed at once, which is unlikely, you need to take care that the atmosphere around the remaining seed in the packet is as dry and clean as possible. Most people with average-sized gardens won't need to sow a whole packet of seed at once - despite what the packet tells you! (obviously they're trying to sell seed!) When you've taken all the seed you need, squeeze as much air out as possible, seal with sellotape, write on the date it was opened, and store somewhere really cool and dry. Most seed except carrot and parsnip will last well for at least a couple of years this way. People always say "but the experts say store them in the fridge" - all I can say is those 'experts' must have nothing else in their fridges - or have dedicated seed fridges! Since when were most household fridges absolutely bone dry? But then perhaps yours is a bit tidier than mine! Frankly - I'd sooner tidy my polytunnel any day than my fridge! 3. When you're opening the packet of seed, make sure that all the seed is shaken down to the bottom first. Then slit it open with a sharp knife or with scissors rather than just tearing off the top - this makes it much easier to do up neatly again afterwards. The seed may also be in a 'stay-fresh' foil packet inside the paper packet, so open that carefully too, then when you've finished, re-seal afterwards in the way described. It always says on the packet "Do not re-seal" - pay no attention whatsoever to that! Seeds will just absorb atmospheric moisture far more easily if you don't re-seal them properly - then you'll have to buy more seed because it won't germinate nearly as well! Lettuce - sown 2 per module - ready for thinning. 21st. Feb.
4. Tip a very small amount of seed - slightly less than you think you'll need - into the dry palm of your hand or onto a saucer and carefully sow the amount you want into each module. Never put seed back in if you've tipped out too much into your hand, unless your hand is very clean and dry! I sow lettuce, brassicas etc. in two's or three's thinning to the strongest one when the seed leaves (cotyledons) are fully expanded and there's one 'true' leaf just showing, then you can judge which is the strongest, or if any are 'blind'(which can sometimes happen with cabbage family/brassicas in particular) - then pull the others out very gently and carefully. Beetroot or chards can be sown singly - they are multi-seeded - producing several seedlings in a clump from just one lumpy seed, which you don't have to thin too much unless you want to - I never do - I normally leave three chards in a clump! They grow perfectly well as normal - and I'm greedy! Some modern F1 varieties of beetroot are 'mono-seeded' - these are useful if you just want one seed per station and bigger roots eventually - but the seed is usually much more expensive and I don't want massive roots. I prefer medium sized or baby beets to pickle or roast - so I use normal varieties and I leave them in clumps of 3 or 5. They will push each other apart quite happily as they grow and find their own growing space. 5. Cover the smaller vegetable seeds with vermiculite, which is available in all good garden centres now in small packs (if it's too much, split it with a friend - it lasts years as it's sterile and you don't need that much). 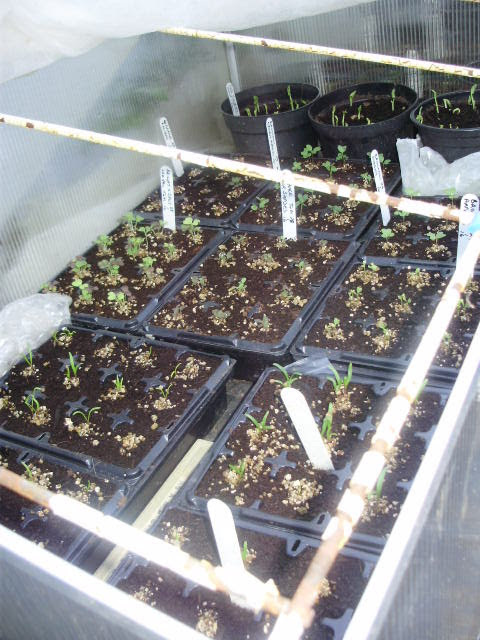 This promotes really good drainage and air circulation around seedlings which is vital and usually avoids nasty 'damping off' diseases, which can otherwise be a big problem with early seedlings in particular (but never in peat-free composts). Sit the seed tray, pots or modules in a tray of water for a few seconds (new cat litter trays are a good size for standard seed trays, and much cheaper than something similar sold in garden centres!) but don't let the modules or trays get saturated. If by mistake they do - then a good tip is to sit them on a folded up newspaper with a bit of kitchen paper on top, which acts like blotting paper to draw out excess moisture - newspaper on it's own doesn't work quite so well. Don't forget that if things are too wet - even if they're warm - they're far more likely to rot. Bigger seeds like peas and beans can be covered with compost and then watered from above initially. I put my early peas and beans onto damp kitchen paper on a covered plate or tray somewhere warm to germinate them first. Usually the back of my range cooker where I can keep an eye on them. This is particularly good for French beans later on in spring - which can be very prone to rotting if sitting in wet compost for too long. I then put the sprouted seeds into a pot in the usual way and cover them with seed compost. I then water them lightly at first, again making sure I don't saturate! 6. Cover the seed tray or modules after sowing by putting in a clear polythene bag, under a sheet of clingfilm or glass to keep them moist and stop them drying out, and put them in a suitably warm place. Check the optimum germination temperature on the seed packet - as not everything likes to be too warm. This particularly applies to lettuces and spinach. Then check every day for germination, and as soon as they appear, uncover them immediately and put them into good light - but not strong sunlight as this could burn them and kill them very quickly. 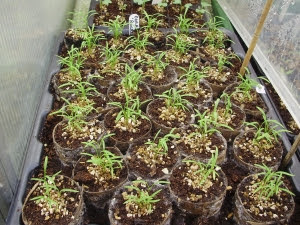 If they're in the house on a windowsill, turn them round a bit every day so all the seedlings get equal light to prevent them getting etiolated (or drawn up and spindly), which weakens them and makes them much more prone to disease. You could also make a light reflector of tin foil fixed to a couple of barbecue skewers at the back of the pot as I used to years ago! At night then bring them into the room before you close the curtains otherwise they could be frost damaged. If they're in a cold frame, greenhouse or tunnel outside, shade them lightly from very bright midday sun - which can be surprisingly strong through glass, even at this time of year. Again, do make sure they're protected from frost at night with fleece suspended over them - not resting on them - or newspaper. 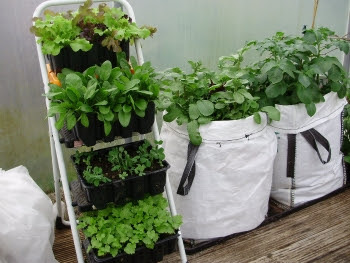 Wire hoops are useful for this, also recycled old freezer baskets, a propagator lid or cloches etc. 7. 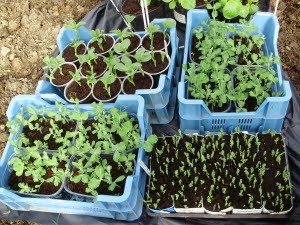 Always water trays of young growing seedlings from underneath when necessary - sitting them in a tray as described above, using clean, ambient temperature water if possible. Watering them from above with a watering can again encourage damping off diseases. I keep clean rainwater in a barrel in the tunnel for watering, which is usually not too cold. Seedlings don't enjoy sitting in a freezing cold bath any more than you do! And they enjoy rainwater best of all. Like all plants, they didn't evolve to appreciate chlorine, or anything else that may be in tap water! 8. After germination, grow on seedlings of tender veg. like tomatoes etc. at a slightly lower temperature but still in a warm light place- where they won't get chilled if it's cold at night. A roll-out heat mat which you can put on a greenhouse bench is convenient for this - or if you're good at DIY - you could make a cheaper large area of gentle bottom warmth by using soil warming cables buried in sand. Be careful that propagators don't overheat, get them set up and going for a few hours before you start sowing your seeds, because just as too little warmth can damage seedlings - so can overheating. It can can seriously damage their cropping potential. From March onwards all small seedlings will need some shade at midday under glass or in a tunnel - fleece also makes a good temporary sun shield. A small max-min thermometer is well worth buying, they're far more useful in the garden than a soil thermometer, and cheaper. As I've already said - you don't need a soil thermometer out in the garden to tell you when the soil outside is warm enough for sowing - all the weed seeds germinating will reliably tell you that! I find the two things people get most screwed-up about are making compost perfectly and having perfect soil. Perfection is actually required in neither! If you're starting off on a new patch like many people I've spoken to recently - you'll obviously need something to plant your modules into! Be realistic! Soil doesn't need to be a perfect seedbed for just planting into. Also remember that plants want to grow! Given a decent start, they'll often surprise you and grow really well in even the most difficult ground. If you're in despair because your soil is badly compacted and lumpy - perhaps in it's first year or so after builders have left it in a state - then just break it up a bit, and make some 'planting pockets' in it. Put a little potting or garden compost into a planting hole to plant in - just like planting into a pot - but in the ground instead! This makes your compost go much further too! When you've done that, then use organic mulches like grass clippings in between the rows which will gradually break down and be pulled in by worms. Green manures are also useful - they improve soil and keep weeds down as well - killing two birds with one stone. You don't have to pile on tons of manure. It's unnecessary, may be far too high in nitrogen leading to unhealthy growth, can be wasteful of nutrients and could cause pollution, particularly with our current rainfall! It may also emit nitrous-oxide - a climate-damaging greenhouse gas 300 times more powerful than CO2! Anyway - in the real world - most back gardeners find well-rotted organic manure hard to obtain. Non-organic manure can contain all sorts of nasty things like animal worm treatments (not good for soil life), weedkillers and also straw-shortening chemicals. Non-organic mushroom compost will usually contain the same! These toxic agricultural chemicals can damage your soil, your plants and your health. The very best way to improve soil is always to grow things in it! I know this sounds like a bit of a daft contradiction - but as long as you've just broken the soil up a bit and it will drain reasonably well - you'll be amazed just how quickly even virtual subsoil will respond to some TLC! I've proved it! Seaweed meal (ground laminaria seaweed - not calcified seaweed) is really helpful on damaged soil and it works astonishingly fast. You'll find it far more cheaply in agricultural feed merchants than garden centres - 25 euros for a 25 kg. bag. Garden centres charge at least double for it! It's brilliant for encouraging all the microbial life in the soil to multiply quickly. and also encouraging heavy, sticky clay soil to 'flocculate' (or in other words stick together to you and me)! That helps it to drain better. Seaweed meal is even used now on the sides of new motorways to get soil ready for being planted - and I must say I've seen plenty of new gardens that looked like motorways after the builders have left!! Where my new polytunnels are looked like that a few years ago! To improve really badly damaged or compacted soil I would use a combination of organic mulches and seaweed meal. Then I would grow potatoes in 1/4 of it, maybe peas and beans which aren't too fussy in another 1/4 - planted in pockets as I've said - and then perhaps cover the rest for now or again plant in pockets - perhaps growing something large like courgettes or pumpkins through black polythene with a nice organic mulch underneath, later in the summer, to encourage the worms to help you!. There you have the beginnings of your four-course rotation! And the soil microbial life and the worms will just gradually do the rest! Very deep cultivation isn't good for any soil life either - it really doesn't appreciate being turned upside down every year just as it's warmed up and got used to a nice bit of fresh air and sunshine, any more than we would! Leave it near the surface - where it all evolved to be. Each kind of microbe or fungi prefers it's own level - but most live in the top few inches or so. A little bit of light 'scratching around with a fork' doesn't hurt it at all - in fact introducing the extra oxygen can rev all the microbial life up a bit in spring because it does actually need some air. But all that macho, nightmare double-digging stuff just buries it so far down that it takes ages to recover and fight it's way back to the surface again! It also destroys worm burrows which help drainage, and the fungal hyphae (or threads) which break down and recycle carbon, releasing nutrients and helping plants to grow. If you keep doing that every year like some people I know do as a matter of course - your soil will never be truly healthy because you're giving all the soil life a very hard time! Obviously you may need to break up new, possibly compacted soil initially by cultivating the surface or to loosen any possible compaction of the subsoil by sticking a long fork in and just gently lifting a little to help improve drainage - but don't bring subsoil to the surface by double digging. After that - minimum work for maximum output has always been my preferred method. I like to make life as easy as possible - but I don't call it 'no dig' because it isn't - In reality there is actually no such thing! It's just an attractive idea that sounds good! Minimal dig is how nature does it - with the occasional scratching or rooting around by birds or large foraging animals - like us - or pigs! You don't need to worry about expensive soil tests for micro-nutrients! In a new garden or allotment though - just do a soil pH test first. That's really all you need to do - there's no need to over-complicate things. If the pH is right - then plants can help themselves to whatever they need, aided and abetted by their symbiotic microbial friends in the soil! You can buy a small, easy to use test kit complete with instructions from most garden centres or DIY stores now. A soil pH of 6.5-7 is what most vegetables prefer. If you need to raise the pH of your soil, you can adjust if necessary by adding either calcified seaweed - which contains calcium as well as valuable trace elements, ground limestone, or Dolomitic limestone - which contains magnesium. All of these have a much gentler action on the soil than hydrated lime. Lime is best added in the autumn to vacant beds after legumes (peas & beans) - where next years brassica (cabbage family) crops are to grow. Never add lime to potato beds before planting - it can cause potato scab. Potatoes prefer a slightly acidic soil. Never add lime at the same time as manure either - as that can cause a reaction which 'locks up' nutrients so that they become unavailable to plants - this shows in a yellowing of the leaves called 'chlorosis'. This can often be a problem in old gardens, which may have been limed routinely every year without doing a pH test to see if it was actually needed. Calcified seaweed is the only kind of pH-raising agent that I would ever use if necessary just before planting a crop. Tomatoes seem to particularly appreciate it. Whatever type of garden you're starting off with - it's always good to get a rough idea of the soil pH anyway. Once that's right - plants will be able to help themselves to the food they need - helped by the worms and all the other vitally important microbial life in the soil which breaks down nutrients into a form that plants can absorb. Worms and vital soil bacteria don't like acid soils - so getting the pH right is also very important for them too. Out of interest - acidity is why spaghnum moss from peat bogs was often used as an antibacterial would dressing during the First World War! Worms and other soil life are also encouraged by growing green manures, by adding organic matter like compost, and by using organic mulches. Don't be tempted in a new garden to use a glyphosate the so-called 'total' weedkiller to get rid of weeds before you start - there is a huge body of evidence that shows glyphosate actually kills aquatic life like frogs and soil microbial life. So if you use it you would be killing off the things that actually help you, by making nutrients available to plants! It has also been shown to persist in soil and to be taken up by plants growing there afterwards - despite the makers disingenuous claims to the contrary! Quite apart from that - even if you don't care about the environment, or poisoning yourself, your pets, soil and local water supply - glyphosate doesn't actually kill weed seeds! They'll germinate as soon as you cultivate the soil at all! So not only is it a very dangerous chemical - but it's also a hideous and expensive waste of money! If you've got too much ground to cope with then just cultivate a small bit first - and either mow the rest, keep some chickens or other livestock on it, or cover it with some grass clippings, compost or well-rotted manure and then a light-excluding waterproof mulch. That will get the worms working furiously - which hugely improves the condition of the soil and also prevents and kills weeds by excluding light. When you uncover it in a few months or a year - you will be astonished at the transformation! Roundup (glyphosate) won't do that for you - you'll just end up with a dead, lifeless soil - incapable of growing genuinely healthy plants! As I'm always saying - let Nature do the work - it's free - and only too willing to help if you encourage it a bit! Don't be tempted to use non-organic mushroom compost anywhere you're growing food - it may seem like a nice easy option but it will almost certainly contain very nasty and extremely persistent pesticide residues which I've already mentioned - which can last for many years in the soil. It also has a very high pH - so it can be really bad for low pH plants like Rhododendrons or blueberries causing 'chlorosis', 'locking up' of vital nutrients and stunted yellowing growth. Use mulches of grass clippings or leaf mould instead. And while on the subject of soil - something else I'm always going on about - but it's worth repeating because I see people doing it all the time - in fact I've seen many pictures of people proudly displaying their so-called 'clean' soil on twitter! It hurts me to see them! Leaving bare soil uncovered may well give you a nice surface 'tilth' to sow into and it may look lovely and organised - but it's incredibly thoughtless and also selfish! I will repeat this again! - PLEASE - Do not leave bare soil uncovered at this time of year! Doing so causes pollution, loss soil and of valuable nutrients and also emission of climate-changing greenhouse gases! If you buy things like rhubarb, asparagus or Seakale roots in those plastic packs in garden centres - pot them up in a nice free draining compost immediately you get them home as they're expensive and may well rot in the packets if you wait until outside conditions are suitable. Then you can plant them out in a few weeks when the soil is warmer. 'Chit' seed potatoes in a cool, frost free, light place if they're for planting direct outside in March. 'Chitting' means getting them to start sprouting shoots. Some varieties like 'Pink Fir Apple' may be reluctant to do this, so if you find it a problem, you can fool them and get round this by putting them in a slightly warmer place, like under the kitchen table, and covering them so that they're in the dark. They'll start to sprout very quickly this way. Then put them back into a light, cool place again so that the shoots don't get too long and brittle. Short stubby shoots will be stronger than long spindly ones - and less vulnerable to damage when you're planting out later straight into soil as opposed to compost. I start off all mine in pots now so length of shoot doesn't matter, and then I plant them out like herbaceous plants a bit later in spring. This way they start into growth far quicker and I get bigger crops before any blight strikes - which these days is getting earlier. This also means I can grow for the very best flavour - I don't like the taste of any of the so-called blight-resistant ones. We don't eat potatoes every day here, so quality rather than quantity is what I aim for. The pot-grown potatoes 'Mayan Gold' & 'Lady Christl', started off in the warm and pictured here in mid-February a couple of years ago in polytunnel - are almost ready for planting. You can plant Jerusalem artichoke tubers outside now if the soil's not too sticky - or again alternatively into pots to plant out later. They're a really useful winter vegetable that are dead easy to grow anywhere, so they're great for breaking up rough ground like you might have on a new allotment. They're also very nutritious - and extremely good for the immune system as they contain something called Inulin - a prebiotic fibre that can really rev up the good bacteria in the gut - with occasionally somewhat anti-social results! As they're tall they also make a very good windbreak - ironic that! In a mild autumn they also have very pretty yellow flowers, which are good for picking, being a member of the sunflower family. 'Fuseau' is a good, less knobbly variety, very widely available now. They're delicious as a Dauphinoise, raw in a salad, oven roasted, used almost raw, like water chestnuts in a Chinese stir fry, or made into soup. They're also almost impossible to lose - so be careful where you plant them, you'll have them there forever, unless you have a few pigs to root them up! They love them! As I mentioned in the sowing details - you can also still plant 'spring planting' varieties of garlic too. 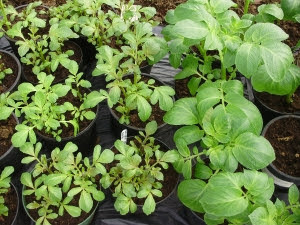 Or if the soil is too wet - just pop them into some modules to root or pot them up into small pots for future planting. This isn't a money-making site, I don't have any product to sell and all the information in it is freely given, in the hope that it will be useful to readers. It's the sort of advice that I would have very much liked to have been able to find, when I was just beginning my gardening 40 years ago. Also please note - that I don't have/or want any ads. or so-called 'editorial pieces' (just basically ads in another form!) from other sources on my website. I have been asked many times to take them in return for a fee - even from companies whose ethos I might generally approve of - but I always refuse. This is not meant in any way as a criticism of those people who do accept them. That is their choice and we all have to make a living - but I prefer to have the freedom to speak my mind frankly and to voice my own opinions without the possibility of being influenced by what an advertiser or potential sponsor may think. As a result my blog may look a little old-fashioned compared to some - but fancy websites with bells and whistles cost money. Many people have told me that they actually prefer it this way though, and that it comes as a nice change! The only concession I have made to modernity was to join Twitter a couple of years ago, which a lot of people had asked me to do over the last few years - so I finally relented! I have to say it's fascinating - though it can be time-consuming! If you're a new reader you may have noticed that I can be pretty outspoken at times too - but I do my research! If I recommend any product then you can be assured that it's always something that I've found useful myself - usually over several years. I don't accept 'freebies' or discounts of any sort in order to promote other people's products either - so please don't send me any - or you'll be disappointed! Another reason I don't accept ads. is that I personally find them intensely annoying popping up all over the place, often totally unrelated to the content of the site. I also hate to read something that may look interesting and then find out halfway through that actually it's actually promoting a product! It's impossible to know then whether what you're reading is actually an honest and impartial opinion, so I'm afraid I tend to be a little cynical about that and usually leave those sites immediately! Perhaps I'm a little old-fashioned - but to me, my integrity is worth far more than money. I think that useful information garnered from long experience, and truly objective, honest opinion are important. That is what I try to give readers of my blog and I hope you will continue to enjoy it. I want to say a big thank you to all the people who have emailed or tweeted on Twitter to thank me for my advice! I'm sorry if I don't always have the time to answer you all individually - but it does makes all the work really worthwhile. Your gratitude is so very much appreciated - and is great motivation to do even better! Thank you for paying me the great compliment of reading it!